A few months ago, JAPAN Style featured an article (http://www.japanstyle.info/05/entry17051.html) about a unique mascot character, Manbe-kun. He is a character from a small town, Oshamanbe Town in Hokkaido. 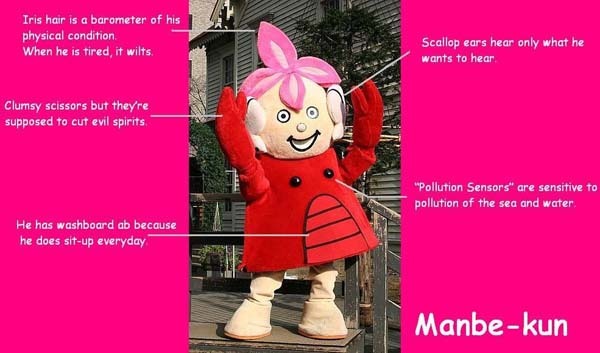 Usually, mascot characters are cute and harmless. But Manbe-kun is totally different! He kept using offensive language on his Twitter page, and his sharp tongued demeanor made him popular. But this month, his Twitter account was forced to close. The person who was running Manbe-kun’s Twitter account was the president of a web marketing company in Sapporo, Hokkaido. He was born in Oshamanbe and got the official license to use the Manbe-kun character for his hometown revitalization (non profit). He really loved his hometown and wanted to let many people know the real Oshamanbe, so he tried to tweet not only good sides but also bad sides. Some radical comments about World War II he posted on Aug. 14 (the day before the anniversary of the end of the war) became conclusive. A number of complaints were directed to Oshamanbe Town, and the mayor apologized, stripped the license, and forced closure of the Twitter account. The marketing president who had the Twitter account also apologized, but things don’t seem so simple. He shows no sign of regret and still keeps making some kind of suggestive/aggressive comments on his personal Twitter account.